New Year, New Opportunities--for you! I just LOVE this time of year! Everything gets the opportunity to be seen through a different lens. The opportunity is there to look at life afresh, make things new and start over if necessary. I just love the feeling! I have set a few goals for this new year (yes, the age old lose some weight goal is one of them!) and I feel ready to get them going! As a Fun Stampers Journey coach, I couldn't help but share about an amazing opportunity for you to take on something new for 2016 and beyond! 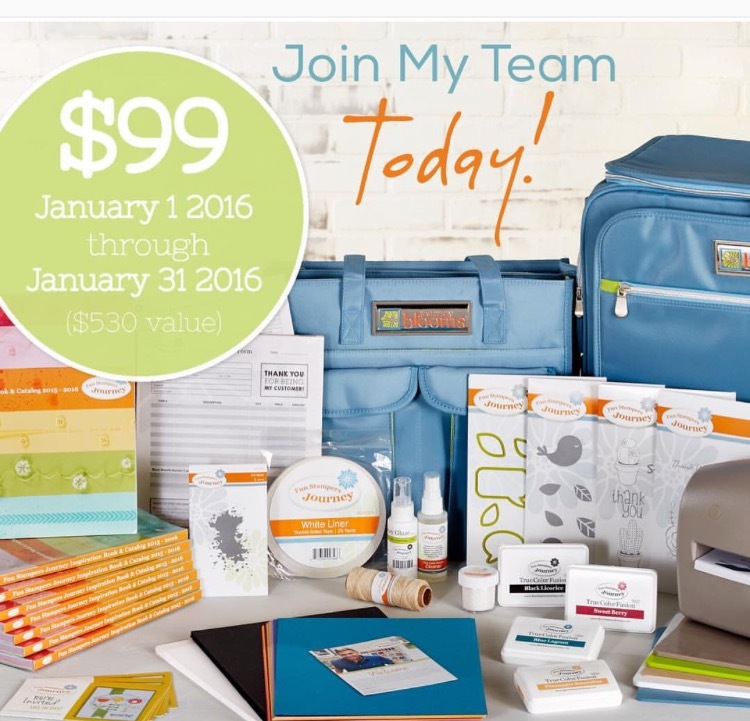 For the month of January only, you can sign up to be a Fun Stampers Journey coach for just $99. This is really a super crazy deal!!! The Journey Grand die cutting maching itself retails $149!!!! Not to mention that you get everything you see in the picture about and the stamps and ink colors are customizable (meaning you can choose the ones you want!). Seriously, if you have been on the fence about joining, NOW IS SO THE TIME! LOL! You can sign up directly from my website www.funstampersjourney.com/janicewhiting or simply contact me and I can walk you though! If you have any questions, just let me know! I am happy to help in any way I can! So, whether you decide to take advantage of this crazy deal or not, I hope you have a wonderful 2016 and that it goes off with a bang!